Catalina Maria Johnson, the host and producer of Beat Latino, as well as contributer of features on Latino musical arts to Chicago Public Radios, credits her bilingual and bicultural heritage to the tenacious insistence of a Mexican mom and a German/Swedish dad. Thanks to them, she grew up between two cities named St. Louis, one in Missouri, and the other, San Luis Potosi, Mexico. 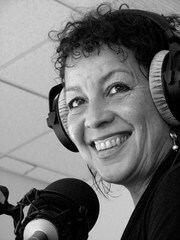 Having traveled extensively and lived in Mexico, Spain, Portugal, Honduras, Colombia, and other Latin countries, as well as having circled the globe at least once, visiting most of Europe, India, Japan, and Kenya, Catalina infuses her Latino/Latin radio shows with a multi-cultural perspective, highlighting the great richness and diversity of Latin music reaching back to classic recordings and looking ahead for the best of today's emerging sounds, styles, and performers. Beat Latino specials for March and April!